Authorities used pepper spray and fired bean bags at activists demonstrating against a controversial North Dakota oil pipeline as the standoff there reached a new peak Thursday, according to officials. Armed soldiers and police in riot gear removed the demonstrators using trucks, military Humvees, and buses Thursday afternoon, according to The Associated Press. Two helicopters and an airplane scanned the operation from the air. At least 141 protesters were arrested as of midnight Thursday (1 a.m. ET) after law enforcement slowly closed in and tensions escalated, the Morton County Sheriff's Department said in a statement. Seven protesters used "sleeping dragon" devices, which typically involve PVC or other pipe, to attach themselves to items, and fires were set on a highway and improvised fire bombs were thrown at law enforcement, the Morton County Sheriff's Department said in a statement. One woman allegedly fired three shots from a revolver at police, an emergency services official said. No one was hit. The chairman of the Standing Rock Sioux Tribe criticized law enforcement’s “militarized” response to the camp and called for demonstrations to remain peaceful, but stressed that activists would not give up their cause. "We won’t step down from this fight," he added. "As peoples of this earth, we all need water. This is about our water, our rights, and our dignity as human beings." Archambault also called on activists to "remain in peace and prayer." "Any act of violence hurts our case and is not welcome here," he said. Law enforcement were holding a line north of the Backwater Bridge early Friday morning, the sheriff's department. A woman who was being arrested pulled a .38 caliber revolver and fired three shots at law enforcement, "narrowly missing a sheriff's deputy," North Dakota State Emergency Services Spokeswoman Cecily Fong told NBC News. The woman was taken into custody and no shots were fired by law enforcement, she said. The protesters were ousted from the camp that authorities said was on private property in the path of the pipeline late Thursday afternoon, Morton County Sheriff Kyle Kirchmeier told the AP. The sheriff said that while the camp was secure, officers were still dealing with protesters in the surrounding area, according to the AP. Kirchmeier added that authorities would maintain a presence in the area for the time being to keep protesters off the land. Fong confirmed to NBC News that the camp was cleared. Protesters allegedly started two fires on the Backwater Bridge protest site and threw Molotov cocktails at law enforcement Thursday night, Fong said. About 250 protesters had gathered at the camp and another 80 demonstrators with a dozen horses were at the site of a county road, according to a statement from the Morton County Sheriff's Department. Protesters on horseback galloped toward the law enforcement line before wheeling around and some had begun throwing objects at the officers, Fong said. Demonstrators also allegedly set four DAPL construction vehicles ablaze, Fong said Thursday evening. "They’ve definitely escalated, they’re throwing rocks and debris," she said. A handful of officers suffered minor injuries, she said. Officers fired bean bag rounds and used pepper spray on protesters, Fong said. Authorities also used a long-range acoustic device with a high-pitched tone to disperse the protesters, who set tires on fire on the highway Thursday afternoon, according to a post on the Morton County Sheriff’s Department Facebook page. The department said they repeatedly told the demonstrators they were "free to go," asking them to move to a separate camp further south and let authorities put out the flames. The protesters also set an area on fire near a bridge on a county road, according to a statement from the sheriff's department. The protesters, comprised of a group that includes Native Americans and environmental activists, had been camped on private property since Sunday near the $3.8 billion Dakota Access Pipeline, near the town of Cannon Ball. The 1,172-mile pipeline would run within a half-mile of the Standing Rock Sioux reservation. Opponents of the project say the pipeline could adversely impact drinking water and would disturb sacred burial sites. Hundreds of protesters from Standing Rock and other tribes have set up camp for months in protest a few miles away from where Thursday's confrontation occurred, close to where the Missouri and Cannonball rivers meet. Thursday’s incident came less than a week after more than 80 people were arrested and authorities used pepper spray on demonstrators. The arrests came during a five-hour conflict with police and around 300 protesters, some of whom stubbornly parked cars on the highway near the camp to block authorities from reaching them, according to the AP. They also set a small fire at one of two blockades they set up on the highway. The majority of the protesters were retreating from the area of confrontation on the highway outside the camp, but had not fully left the area of private land, according to the AP. About 200 protesters remained in the area, listening to tribal elders speak and praying as authorities continued to approach. Law enforcement officials began taking steps to remove roadblocks and protesters of the Dakota Access Pipeline near Highway 1806 at around 11:15 a.m. local time (12:15 p.m. ET), Kirchmeier said in a statement. "Protesters’ escalated unlawful behavior this weekend by setting up illegal roadblocks, trespassing onto private property and establishing an encampment, has forced law enforcement to respond at this time," he said in the statement. “I can’t stress it enough, this is a public safety issue," the sheriff said. "We cannot have protesters blocking county roads, blocking state highways, or trespassing on private property." 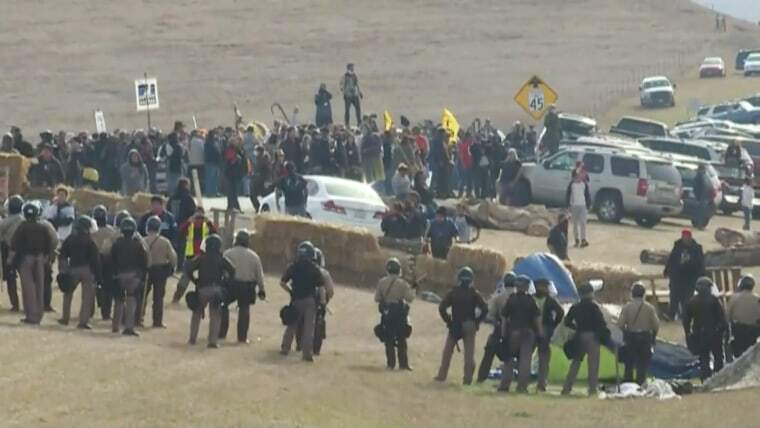 The protesters had created a camp in the pipeline’s path on private property known as the Cannonball Ranch on the side of the highway and set up the roadblocks along on Sunday, according to the statement. Highway 1806 remained closed Thursday between Fort Rice and Cannonball, according to the sheriff department's statement. Various counties, cities, state agencies and out-of-state law enforcement were helping the Morton County Sheriff's Department, the statement said. Democratic presidential nominee Hillary Clinton's campaign weighed in on the protests Thursday evening. “From the beginning of this campaign, Secretary Clinton has been clear that she thinks all voices should be heard and all views considered in federal infrastructure projects,” Spokeswoman Xochitl Hinojosa said in a statement. “Now, all of the parties involved — including the federal government, the pipeline company and contractors, the state of North Dakota, and the tribes — need to find a path forward that serves the broadest public interest,” Hinojosa said. “As that happens, it's important that on the ground in North Dakota, everyone respects demonstrators' rights to protest peacefully, and workers' rights to do their jobs safely." Protest camp coordinator Mekasi Horinek told NBC affiliate KFYR on Wednesday that the protesters had no plans of leaving their encampment. Standing Rock Sioux Tribe chairman Dave Archambault II told NBC News on Sunday the tribe had asked the U.S. Department of Justice to intervene in the escalating situation with law enforcement. "The DOJ should be enlisted and expected to investigate the overwhelming reports and videos demonstrating clear strong-arm tactics, abuses and unlawful arrests by law enforcement," Chairman Dave Archambault II said.